Coming back with another haul post isn't part of the plan. But a lot of surprising ups and downs have happened this month which made me and my family really busy. Anyway, I really don't like dragging people down with my personal problems but I do think that I had to share it with you guys. (Only my closest friends and relatives knew about this). This is one of the many reasons why I was almost always offline or if ever I was online, I would probably just be liking a thing or two then I would quickly log out. 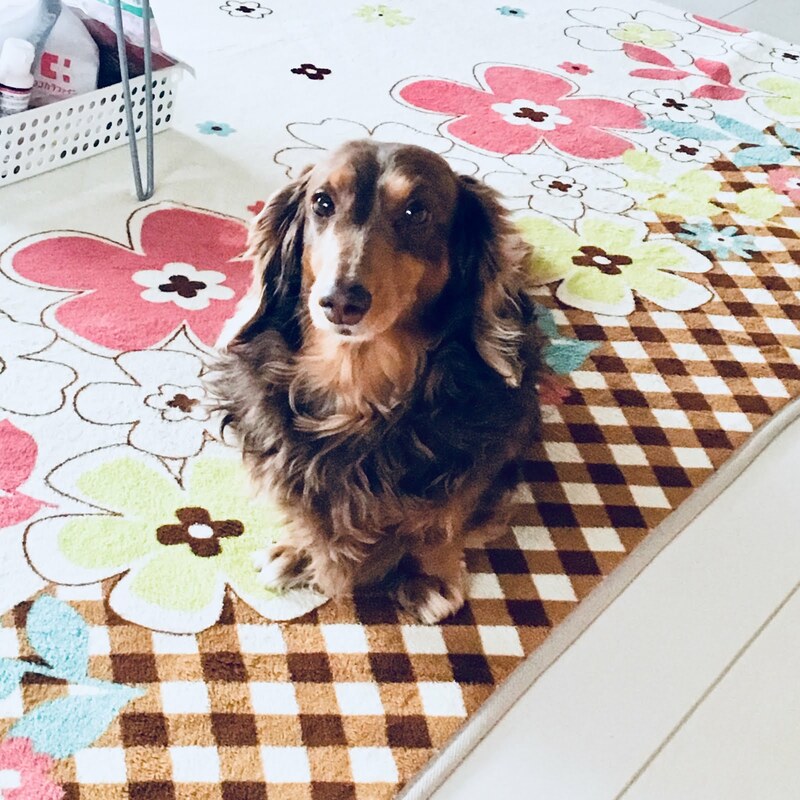 Our 8-year old Dachshund dog was rushed to the hospital mid-July. I really thought it was just his another body cramps emergency but to my dismay, he came home with rear limbs numb and unable to walk. I was devastated. Seeing an overly energetic dog and a ball of happiness crawling with eyes seemingly begging for help, instead of his usual jumping and his matchless speed when running, really hit a huge spot in my heart. The pain felt as if someone's stabbing my chest. I cried myself to sleep. After all these problems, come an even brighter tomorrow. I do believe in miracles! He's still a candidate for a certain (incurable) disease though, but at least, he was not suggested to undergo surgery and he's already undergoing proper medical treatment almost every week, hence the improvement in his face (he's livelier and happier) and body movements. If you ever have a dog, I know that you know exactly how we're feeling. This dog is 'family'. He's been with my parents longer than I've ever been with them here in Japan. If it is not so much to ask, please include our dog in your prayers. 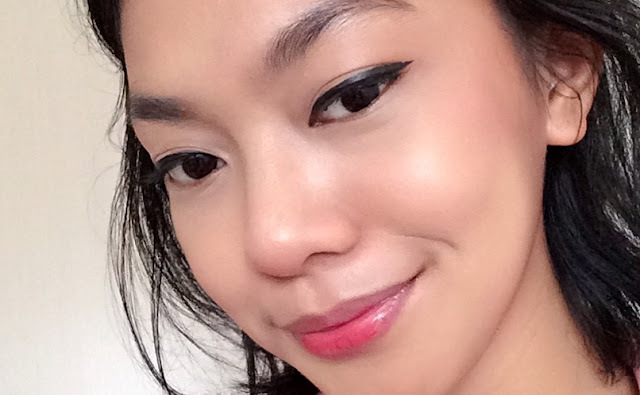 As promised, here's a review of my favorite brush pen eyeliner ever. If you're still wondering how brush pen liners differ from regular liquid eyeliners kindly check out this post. Now...WHY DO I LOVE K-PALETTE REAL LASTING EYELINER? • It's indeed long lasting but it doesn't take so much time to remove. I know, right? How is that even possible? I dunno but one thing's for sure, K-palette makes it possible. I have teary eyes and I rub my eyes quite regularly due to my allergies, so wearing long lasting and smudge-proof eyeliners has always been my jam. And for that, I love my K-Palette Real Lasting Eyeliner as it is indeed long lasting but washing it off was never a pain in the back. It washes off like your regular eyeliners quick and easy without leaving any residue. No panda eyes! Also, I need not to tug the delicate areas of my eyes to totally clean away everything. Easy peasy! • It dries completely matte devoid of shine. I'm big on matte, solid black eyeliners. So I've always liked the color payoff of pencil and gel eyeliners for this. But they always come short with regards to application and life span so I converted to brush pen eyeliners. The problem with brush pen liners though, most of them sets into a faux silky black finish. Well, except K-Palette Real Lasting Eyeliner of course. It sets into a beautiful matte black without the plasticky texture that is prone to chipping. • Perfect pointed brush that responds perfectly to any direction. I've tried many high street brush pen eyeliners but nothing beats K-palette Real Lasting Eyeliner when it comes to brush precision. It is definitely super easy to use that even a beginner can perfect that feline flick in a jiffy! Overall, I know that K-palette Real Lasting Eyeliner isn't exactly cheap at PHP 795 but it's totally worth the price and all 'le hype from the beauty community. Get yours at any Beauty Bar stores (and online), and selected Rustan's, SM Department Stores (including SM Megamall), and even in Zalora PH online. BB Cushion has been under my beauty radar for so long but I only got the chance to try one recently. I was skeptical, to be honest, I thought it was just your-typical-BB-cream-poured-in-a-different-container so I kept on ditching it. Months have passed and recently I noticed that some parts of my skin are enraged. Well, there are many things at play though, like new sets of food taken, new lifestyle, new climate--as I just recently moved to another country. So I had to be cautious. One thing I really do if I want to calm my skin is to rest it from any makeups, most especially base/foundations. And that's when I go for my BB creams--especially if I really need to go out with some makeup on. Besides you can never go wrong with BB creams as they are like tinted moisturizers with even more benefits. So the next thing I know, I was already looking for a good BB Cushion here in Japan. Hehe! Too much for my intro (I really missed writing, yo!) The Missha M Magic Cushion here in Japan comes in a different packaging as it doesn't come with a box but with a transparent plastic standee. In similarity, the cushion itself looks just like most of the BB Cushion in the market. It comes with an applicator sponge, separate sponge holder, and mirror. It's posh and sturdy. Missha M Magic Cushion is fragrant. It has this powdery scent to it that is very refreshing. Consistency and Texture-wise, I find Missha M Magic Cushion more liquidy and runny. Also, it's not as thick as the Missha Perfect Cover BB Cream so it feels a little lighter on the skin upon application. Just like most of the Korean BB Cushions in the market, Missha M Magic Cushion comes in very limited shades. Currently it has two shades available: #21 Light Beige and #23 Natural Beige. I got #23 and it's nothing like the Perfect Cover BB Cream shades which are overly pink-toned for me. Luckily, Missha M Magic Cushion #23 leans on the warmer side of the spectrum. It is yellow toned yes, however it has this little tinge of pink to it. It doesn't leave a horrible gray cast so I'm not complaining. I had very huge cystic and nodular acne by the time I bought the cushion so I was really able to put everything to test. Missha M Magic Cushion was able to cover minor blemishes like dark spots and dark circles but I had to reach out for my concealer to cover up the zits. This cushion has light to medium buildable coverage which is ideal for everyday use. If you are going out for a long event or has a lot of blemishes to cover, a heavy duty primer and concealer would be your best bet. Missha M Magic Cushion sets into a semi-dewy finish. It gives the skin the healthy glow that I really love. As much as I love how it looks, unfortunately, my face can get really, really oily and the heat and oil make it difficult to maintain that beautiful dewy base. I look horrible after 1-2 hours. Yes, that quick! It's horrible to the point that I look like a teenager hitting her puberty with uncontrollable shine on her face and cystic acne. Ugh. Really. Can you just imagine that? Again, that was just 1-2 hours given that I always go and stay in air conditioned places. Everything starts to feel heavy after my skin gets oily too. It feels sticky and icky at the same time. Longevity-wise, once I'm all oily, the cushion easily slips off my face and transfers. Well, it didn't promise to be oil-controlling and transfer-proof so I guess it really can't be helped. On the lighter note, I get to minimize the oiliness/dewiness by topping it off with a finishing powder and using some blotting paper. The Missha M Magic Cushion usually stays on me for 2-3 hours depending on how intense the summer heat is. • What I like About Missha M Magic Cushion? • What I don't like About it? Overall, I really love Missha M Magic Cushion. I still use it regularly even if it's summer and I plan to use it even more during the cooler season because it's moisturizing plus the dewiness makes my skin look healthy and radiant. Thank you for reading! I'm really not into sharing hauls but I realized that I'm running out of queued posts for this month so I decided to share our shopping haul instead. Yep, I usually draft my posts in advance so I could check my grammar again and again. Anyway, I didn't buy a lot though. The amount of beauty products in Japan can be a bit overwhelming so I always make it a point to always research first before purchasing anything. So more or less what I have right now are mostly home necessities and some products I've been meaning to try. Mom bought a polo shirt from Right On (green plastic bag). Right On is a Japanese store that sells jeans as their main item and other casual wear for both males and females. They also offer items from the brands Lee, FILA, LEVI's, PUMA, Vans, etc. As for myself, since I don't have any formal wear whenever I'm here in Japan, we also decided to get a blazer from Emma James New York. I've been lemming to get something from LUSH ever since, so when I saw this Intergalactic Bath Bomb while watching a Japanese show I knew I got to drag my family to the nearest LUSH Cosmetics store! You gotta check how this Intergalactic Bath Bomb works in Youtube. It's amazing! This Intergalactic Bath Bomb and the other one in pastel blue retail for ¥720/each and can be used for one time only! Sounds impractical, eh? Yep. In the defense of these bath bombs, they reaaaally smell so good and they leave your skin extremely smooth after bath. K-Palette 1 Day Tattoo Liquid Eyeliner in Super Black (in Limited Edition Disney Princess packaging) ¥1,200/Php 795 - I've said this before and I'll say it again, K-Palette 1Day Tattoo has got to be my favorite eyeliner ever!...Ever! In depth review coming up, soon! Next in the list is Missha M Magic Cushion Mat SPF50+/PA+++ which retails for ¥1,000 (around 430 in Peso). BB Cushions in the Philippines are usually spendy and are sold for roughly PHP800-1000+. This one is such a steal because (as of checking) this M Magic Cushion costs PHP1,200 in Missha stores in the Philippines! Affordable Drugstore Facial Brush for pore cleaning. As for skincare, mom hoarded from the Vitamin C-line from The Body Shop for herself while she got me some items for my zits. We took advantage of the card points and discounts as summer/seasonal sales are popping up like crazy. Here, we recently bought a formal inner wear plus a 2-piece ensemble consists of a top with French quote printed and a long, wavy vest--which I really really love by the way! Speaking of sales, we chanced upon this 35% OFF discount for some KATE Tokyo Cosmetics. These ones promise to cover up pores, zits, and other imperfections quite well and they're on sale, so why not? Last but not the least are these little things from the drugstore. I got mom a pair of eyeshadow brushes from an affordable brand Rosy Rosa since her MAC eyeshadow quad does not come with one. As for me, I got myself a roll-on deodorant which is very useful during summer and Bioré Skincare Facial Wash.